Recently I was referred by a customer to a local Business Adviser who had a question from one of his clients. The client had signed up for a ‘Website Promotion SEO – Be No. 1 On Google’ package from another local company and the adviser and client were concerned that they were not seeing any results for their hundreds of pounds per month spend. The selling of SEO (Search Engine Optimisation) and Website Promotion services is a growing market. Business owners know that the key to online success – and profit – is a place on the first page of Google search for their popular keywords. Unscrupulous marketing companies appeal to this need. “We’ll guarantee you first place in Google” they claim. Now, as long as the salesperson knows just a little bit more than the buyer and can bedazzle them with his or her guru-like aura, they invariably get the sale. It is partly true of course, we all know that organic SEO takes time to see real results. BUT, what had the SEO company actually done? For that kind of money I would expect, at least, to have seen a keyword analytics report, followed by some changes in the website structure to optimise it organically for the search engines. I would then expect to have seen some regular new content on the site, backed up by at least a basic social media campaign and certainly a blog post or three. Even a modestly budgeted Adwords or Facebook Boost campaign would have been ‘something’. I performed some analytics and diagnostics on the website, quickly finding some fundamental structural flaws as far as the major search engines were concerned. Basics such as page titles, descriptions, headers and the like had not been attended to by the original designer (common issue), nor changed by the SEO company (surprising), as well as a number of other issues. There were a number of spurious and irrelevant incoming links, regarding which the client admitted to having paid for a ‘link-building’ service some time ago. There was zero evidence that the SEO company had done anything at all – apart from, of course, collect several months worth of payments. The suspicions of the Business Adviser and his client were well founded. The client called a meeting with the SEO company and invited the Business Adviser along, as well as my good self. Good timing as it was just before the next payment was due. The SEO man was sharp. Expensive suit, shiny shoes and a pleasant manner. He brought us all up to date with what his company had been doing, lamenting all the hours spent on research and chattering on about how slowly Google moved when you submitted new content. He was good, even I almost believed him – and I would have done if it wasn’t for the facts and the stats. I decided that he had either graduated from RADA with honours or, more worryingly, he actually believed what he was saying. Facts and stats are damn awkward things, they do so often get in the way of a perfect sales pitch, political broadcast or religious sermon. During the pregnant pause after the SEO man’s final statement I suddenly knew exactly how the late Christopher Hitchens must have felt when about to deliver a reposte to a young-earth-creationist. Yes, akin to a cat discovering an opened can of evaporated milk on the kitchen worktop whilst it’s owner answered a knock at the front door. I thought I woud start with something easy. I was struggling to contain myself … Time for a direct question. I faked a cough or two. That seemed so much more polite under the circumstances than my natural urge to instigate a laughing fit so intense as to cause involuntary evacuation of my bladder. After all, I had just washed my jeans. At this juncture I opened up the client’s website and displayed the page source, pointing out the seo-unfriendly meta title and description sections. I then opened the domain control panel and displayed the list of files on the server that made up the client’s website. Crucially, the ‘last-modified’ date stamp on each file was from before the SEO company had took on the contract. A swift right-click later and I was editing the text, changing both the title and the description of the page at source. A refresh of the homepage and a display of the new source file incredibly revealed those changes. Live. A miracle. I await my notice of beatification. Exit stage left the SEO man. He shook my hand when offered as limply as David Moyes shook Pellegrini’s following the recent match at Old Trafford, not even any eye contact. My feelings were so hurt, I had to cough again. The site structure was fixed, at a one-off cost of £150.00. Another local company was brought in who specialise in social media campaigns, their charge for audited management was £150.00 per month. A strategy was implemented to research and produce regular content for the website, involving the client organising some short product demonstration videos. An ethical link-building strategy was begun. Common sense, easily affordable and all easy to audit. There are some very very good SEO and web marketing companies out there who gain fantastic results for their clients. They know what they are doing and put in the hard graft to achieve results and the even harder graft – when not working for clients – to study and research. They read stuff, they listen to Google, they test. If you have one of these, worship him or her and send them gifts (TIP: Malt whisky or corporate tickets to football matches go down very well here). 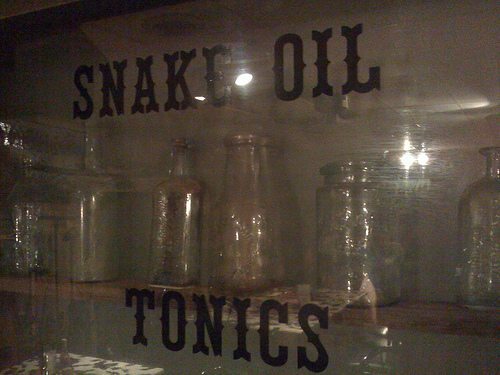 Then, there are the growing number of snake-oil salesmen and charlatans for whom a little knowledge is a very dangerous thing – especially for their clients’ pockets. I’m making it my mission to root these out and show their clients the light. Contact me for a FREE appraisal of your website or even for a secret audit of your SEO Man’s work. If you’re spending money on SEO I will sleep better knowing that your man is actually doing some work. UPDATE (06-06-2014) – The client has just converted three enquiries from his website in the last 2 weeks. These were the first enquiries ever from the website in over 12 months that he knows of.